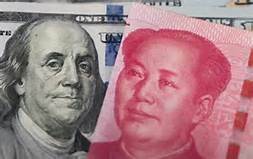 We’ve all heard for a long time about a coming collapse of confidence in the dollar and its displacement as the world’s leading reserve currency. I even wrote a book about that in 2014 called The Death of Money. Events are definitely moving in that direction, but I also make the point that the process does not happen overnight; it can take years. A good example is the process by which the dollar displaced pounds sterling as the leading reserve currency in the first half of the 20th century. That process began in November 1914, not long after the start of the First World War, when gold flows, which had moved from the U.S. to Europe at the start of the war, reversed and began moving from Europe to the U.S. The process culminated in the Bretton Woods agreement of July 1944, which enshrined the U.S. dollar as the only currency pegged to gold (all others were pegged to the U.S. dollar and only indirectly to gold). That process of the dollar displacing sterling took 30 years, from 1914–1944. Displacement of the dollar, probably by the IMF’s special drawing right (SDR), has started, but it will not take 30 years; it will happen much more quickly. Still, it’s a matter of small steps, or straws in the wind. This article highlights an important step in the process. In 1974, President Richard Nixon engineered the petrodollar deal with help from Henry Kissinger and Treasury Secretary William Simon. Under that arrangement, the U.S. agreed to defend Saudi Arabia militarily and to support higher oil prices. In exchange, Saudi Arabia agreed to price oil in U.S. dollars and to deposit those dollars in U.S. banks, where the dollars could be “recycled” as loans to developing economies that would purchase U.S. manufactured goods and crops. Since everyone needed oil, everyone needed dollars to pay for the oil. That demand for dollars sustained the dollar’s role as the leading reserve currency after the collapse of the original Bretton Woods arrangement in 1971. As this article reports, the petrodollar deal is now coming undone. China is the largest oil buyer in the world and is Saudi Arabia’s biggest customer. China is now seeking to pay for its oil in yuan. So far, Russia is the only major oil exporter that has agreed to accept the yuan for oil. They will not be the last. For now, the market for oil priced in yuan is small but growing. This is the beginning of the end of the petrodollar deal. The irony is that the U.S. does not seem to care because we are now an oil exporter ourselves. The U.S. is asleep at the switch as China does to us what we did to the British a century ago.